Shop PcPools for all your solar pool products. PcPools carries the highest quality solar pool heaters and solar pool covers for in ground and above ground pools. 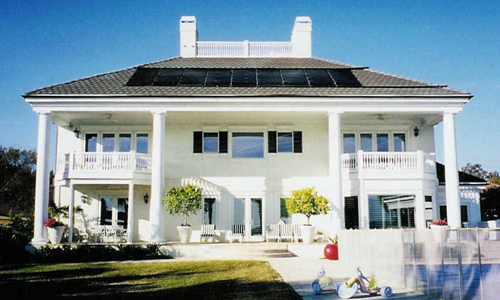 Our solar pool heaters are manufactured by Fafco, Inc the leader in solar pool heaters. We carry high quality Magni-clear solar pool covers in a variety of sizes to fit your above ground or in ground swimming pool. Go Green and Save! Solar Pool Heater uses FREE heat from the sun to keep your pool warm and comfortable this swimming season. Our above ground and in ground solar pool heaters are a great way to conserve nature's precious resources, while saving you money on utility bills. Our Solar Pool Covers & Reels extend your swimming season with our super insulating above ground and in ground solar pool covers. PcPools carries solar pool covers in both blue and clear colors. Our solar pool cover reels make it easy to take your solar pool cover on and off and keeps your pool cover in better shape and makes using the pool cover a lot easier. Check out our great selection of in ground and above ground solar pool heaters, pool covers & reels. PcPools your #1 online pool superstore for all or your solar pool product needs. Expert Advice customerservice@pcpools.com.